The durable and convenient Kentucky EasyToFold state map will take all the wear and tear your journey can dish out. The heavy-duty laminated design allows you to mark your route, make notes, then wipe the surface clean for further use. This is a must-have for navigation whether you're a state resident or just passing through. 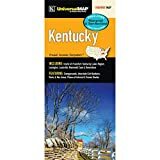 Rand McNally's Easy To Read State Folded Map is a must-have for anyone traveling in and around Kentucky, offering unbeatable accuracy and reliability at a great price. Our trusted cartography shows all Interstate, U.S., state, and county highways, along with clearly indicated parks, points of interest, airports, county boundaries, and streets. Expertly researched and loaded with helpful information, National Geographic's Kentucky Guide Map is a must-have for travelers exploring "The Bluegrass State." Cities and towns are easy to find with the map's helpful index. Highways, roadways, toll roads, scenic routes, and other roads are clearly designated. Distances in miles are noted on major highways so travelers can easily plan their best route. 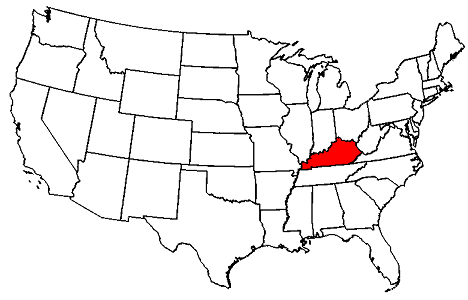 In addition to a state map, inset maps provide detail on the Covington, KY-Cincinnati, OH Area; Land Between the Lakes; Owensboro; Bowling Green; Frankfort, Louisville and Lexington. Additional information and maps feature the recreation activities available in Mammoth Cave National Park and the attractions along the Kentucky Heartland scenic drive which stretches from Lexington to Harrodsburg. National and state parks, public campsites, visitor information centers, airports, ski areas, hospitals, and more are noted. A handy chart of park service sites and climate information are also included. Rand McNally's folded map for Louisville is a must-have for anyone traveling in and around this part of Kentucky, offering unbeatable accuracy and reliability at a great price. Our trusted cartography shows all Interstate, U.S., state, and county highways, along with clearly indicated parks, points of interest, airports, county boundaries, and streets. The easy-to-use legend and detailed index make for quick and easy location of destinations. You'll see why Rand McNally folded maps have been the trusted standard for years. Newly updated, the Kentucky Fishing Map Guide is a thorough, easy-to-use collection of detailed contour lake maps, fish stocking and survey data, and the best fishing spots and tips from area experts. Covering 69 of Kentucky's best fisheries - from the giants like Kentucky, Barkley, Cumberland and Dale Hollow all the way down to the peaceful 3-acre Kingdom Come. Whether you're pitching bucktails for muskies on Cave Run Lake, casting topwaters for schooling stripers on Lake Barkley or catching bass and crappies on Kentucky Lake, you'll find all the information you need to enjoy a successful day out on the water on one of Kentucky's many excellent fisheries. Know your waters. 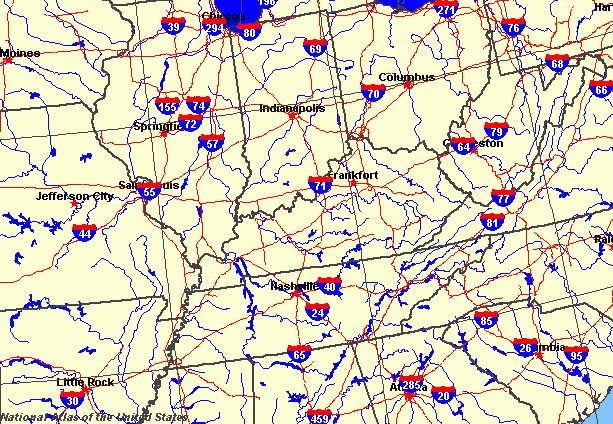 Catch more fish with the Kentucky Fishing Map Guide. Outdoor enthusiasts seeking to enjoy the endless recreational opportunities in the mountains of Virginia will find National Geographic's Trails Illustrated map of Lexington and Blue Ridge Mountains a comprehensive guide to the region. Expertly researched and created in cooperation with the National Park Service, U.S. Forest Service and others, the map covers the area around the eastern part of George Washington and Jefferson National Forests from Waynesboro in the northeast to the outskirts of Roanoke in the southwest. It provides unmatched detail of the such popular recreation areas as Saint Mary's, The Priest, Three Ridges, Thunder Ridge and James River Face Wilderness Areas, Mount Pleasant National Scenic Area, Peaks of Otter and James River. The Blue Ridge Parkway, known for its stunning scenery, is shown with mileage markers, roadside pullouts and parking areas. Use the maps activity and trail guides to help you find a suitable area for exploration, according to your interests and activity level. Each trail is listed with its location, mileage, difficulty rating, blaze color and permitted usage. Trails appear color-coded on the map according to designated use, whether hiking, mountain biking, horseback riding or ATVing. The Appalachian Trail that highlights the area is marked along with its scenic overlooks and backcountry shelters. Other recreation features and facilities pinpointed on the map include campgrounds, alpine skiing areas, fishing and swimming holes, river access points, picnic areas and restrooms. Other features found on this map include: Blue Ridge, George Washington National Forest, Horseshoe Mountain, James River Face Wilderness, Jefferson National Forest, Peaks of Otter, Saint Mary's Wilderness.